Viral Hemorrhagic Septicemia, also called VHS has been found in Wisconsin waters. It is the latest, and arguably the worst potential threat to Wisconsin’s fishery, aquaculture and tourism industries. 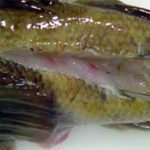 This fish disease can spread from one waterbody to another on boats, trailers, in minnow buckets, live wells and in bilges. The Bayfield County Lakes Forum is very concerned and is working to protect our lakes and streams from this disease. VHS has caused massive fish kills in the eastern Great Lakes, killing game fish and pan fish including musky, walleye, bass, bluegill, crappie, northern and trout. It also affects rough fish and minnows. Many of the experts are concerned that VHS may result in fish kills as high as 80% in infected lakes and that it might take decades for a lake or stream to recover after infection. 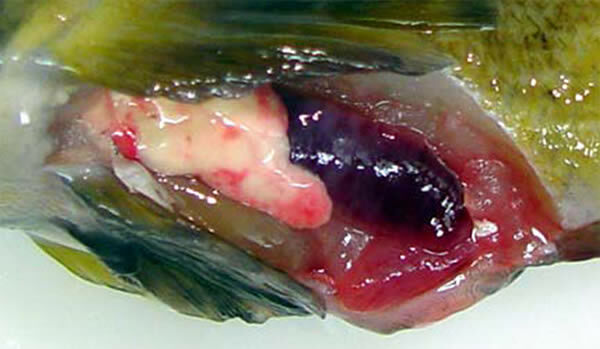 Others believe the disease may develop into a cycle of fish kills that occur on a regular basis. All agree that it is a disturbing threat and that we need to do all we can to keep VHS out of our inland waters if we hope to keep our healthy fishery. Case in point: Estimates are that VHS has killed off 80% of the largest muskies in Lake St. George, a renowned musky water. Biologists feel it will be four decades before the fishery returns to its previous quality, if ever. According to (dnr.wi.gov/fish/documents/vhs_factsheet.pdf), the DNR fact sheet on VHS ‘Infected fish shed the virus in their urine and reproductive fluids. The blood vessels become weak, causing hemorrhages in the internal organs, muscles and skin. 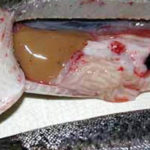 Fish can also become infected when they eat an infected fish. 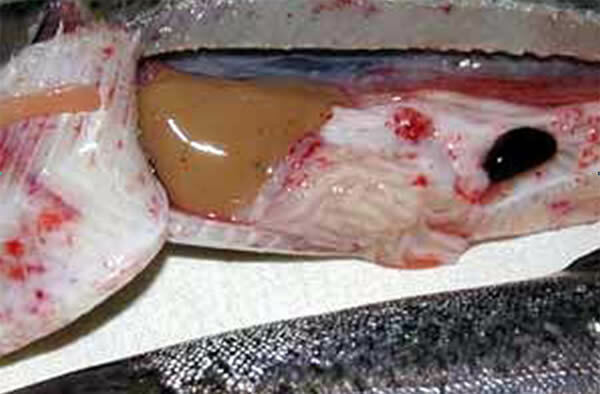 VHS virus can remain infective up to 14 days in water.’ Infected fish often show bleeding through the skin and swollen eyes. VHS began in Europe, affecting rainbow trout populations. It is assumed that it was brought to the US in ballast water, although this cannot be confirmed. What can be confirmed is that following massive fish kills in parts of the eastern Great Lakes, VHS has now been found in Lake Michigan and the Fox River and Winnebago Lake system in eastern Wisconsin. Recent reports of VHS found in Lake Superior are not confirmed. Testing continues. The Bayfield County Lakes Forum is especially concerned about VHS because our county inland lakes and streams are within minutes of landings on Lake Superior and we see plenty of landing traffic from elsewhere in the Midwest. That is why the Bayfield County Lakes Forum, in cooperation with the Bayfield County Wisconsin Conservation Congress is planning several free workshops to help educate folks about this disease. The first workshop was held in Drummond, June 14th, 2007. The BCLF workshops on VHS last about an hour. There is no charge to attend. Any community club or lake organization can request one of these workshops by e-mailing BayfieldCountyLakes@Yahoo.com. The State of Wisconsin now has emergency rules in place that prohibit the transfer of fish into the state without testing, prohibits the use of frozen Great Lakes bait, prohibits minnows used on the Great Lakes and the Lake Winnebago system to be used on other inland waterbodies, prohibits sportsmen from transporting live fish and requires them to drain live wells, bait buckets and bilges. 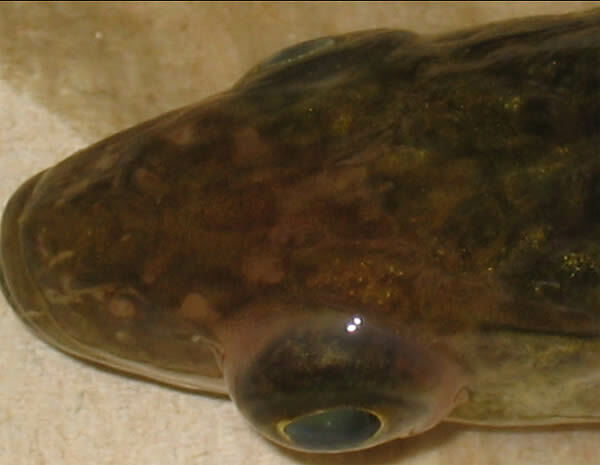 ALL BAITFISH MUST BE DISPOSED OF PRIOR TO LEAVING A WATERBODY. NO LIVE FISH MAY BE TRANSPORTED. When VHS is found in just one more inland waterbody, additional measures will be applied statewide. Many are concerned that by the time this disease shows up in another lake or stream, it may be too late. VHS is at our doorstep now. Wisconsin’s $2 Billion fishing industry, our tourism industry and the property values of Bayfield County’s shorelands are all at stake. We all need to learn everything we can about this threat. The next Bayfield County Lakes Forum workshop on Viral Hemorrhagic Septicemia can be at your lake or community meeting. Contact the BCLF to get on the schedule. All lake organizations, resort owners, sportsmen, local leaders and anyone with an interest in protecting our fishery should help set up these informative sessions. Another opportunity to learn about VHS will be at the Northwest Lakes Conference at Telemark on June 20. The experts will be on hand to give the latest updates and information. For a conference brochure and more information on VHS, visit the Bayfield County Lakes Forum website, bayfieldcountylakes.org. Again, your BCLF representatives are also available to speak to concerned lake groups and sports clubs. Meanwhile, any suspected fish kill should be reported to 1-800-TIP WDNR or to Bayfield County’s Fisheries Biologist, Scott Toshner. Viral Hemorrhagic Septicemia (VHS) has arrived in Wisconsin. 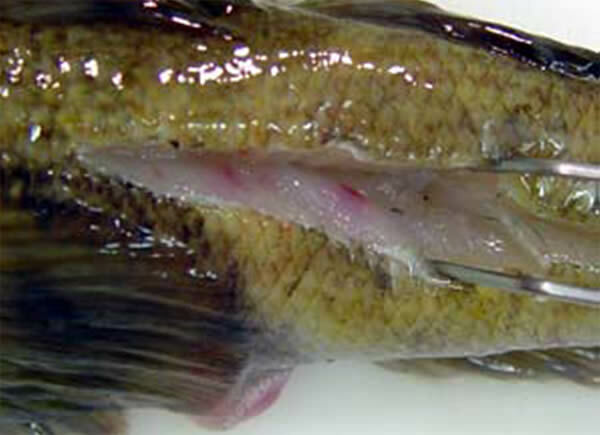 This fish disease has wiped out large populations of fish out east and has many of our Wisconsin fishery and agriculture experts very concerned. Although not harmful to humans, it is clear that this virus has the potential to spread through our inland lakes and streams like a flu virus spreads through an elementary school in January. The experts believe it may affect everything from muskies to bluegills and trout to minnows. The effect on our tourism, sportfishing and aquaculture industries could be catastrophic. Not even the Eurasian Water Milfoil threat will compare with VHS if it arrives in our lakes and streams. First, the Natural Resources Board should immediately apply their Great Lakes and Winnebago system emergency measures to the entire state. They should have done this in May, 2007 when they learned of the VHS fish kills near Oshkosh and Appleton. We can’t afford to wait until more inland lakes are infected. Although inconvenient for anglers and bait dealers, this is no time for kid gloves. The risk is far, far too high. In fact, it is the anglers and bait dealers who should be insisting on this, along with resort owners, the aquaculture trade and all others who depend on tourism and healthy fish. Third, all boaters should spread the word about the need to clean and dry all boats thoroughly before moving to another landing. Clean boats equal clean lakes. Other VHS boating tips are at dnr.wi.gov/fish/pages/vhs.html. Fourth, fishermen must voluntarily not transport ANY live fish other than minnows purchased from licensed Wisconsin bait dealers. Live wells must be drained. Also, as always, minnows must be disposed of on shore, never in the lake. Fifth, until this virus is conquered, the State should provide simple, low-cost disinfection equipment at each boat landing so boaters can quickly spray down their equipment prior to launching and after landing. Although this might cost the State $50,000, it is far less expensive than a major VHS outbreak. Sixth, ALL paid boat landing monitors must be required to receive VHS training. They would then know what to look for and could help spread the word about this threat so all boaters would know how to help. These six steps may slow the spread VHS and give the Dept. of Agriculture and our DNR enough time to get ahead of this disease. But one more important step is needed: Our US Government must immediately stop all foreign ships from dumping their ballast water in the Great Lakes. Over 160 invasive species have come in through our ports, including Viral Hemorrhagic Septicemia. It’s high time the Fed put a stop to this catastrophic policy. Let your US Senators and Representatives know. I urge all who wish to protect our Bayfield County fishery and our economy to help schedule BCLF VHS sessions in your community. Also, consider attending the Northwest Lakes Conference at Telemark to get the latest updates on VHS and many other lake issues. For a conference brochure and more information on VHS, visit the Bayfield County Lakes Forum website, bayfieldcountylakes.org. Meanwhile, sportsmen are asked to spread the word and to report any suspected fish kill by calling 1-800-TIP WDNR. I hope to see you at one of our VHS sessions. Thank you. Viral Hemorrhagic Septicemia (VHS) virus was diagnosed for the first time ever in the Great Lakes as the cause of large fish kills in lakes Huron, St. Clair, Erie, Ontario, and the St. Lawrence River in 2005 and 2006. Thousands of muskies, walleye, lake whitefish, freshwater drum, yellow perch, gizzard shad, redhorse and round gobies died. Many Chinook salmon, white bass, emerald shiners, smallmouth bass, bluegill, black crappie, burbot, and northern pike were diseased but did not die in large numbers. The VHS virus is not a threat to people who handle infected fish or want to eat their catch, but it can kill more than 25 fish species. This is the first time a virus has affected so many different fish species from so many fish families in the Great Lakes. VHS virus is considered an invasive species (not native to the Great Lakes), but scientists are not sure how the virus arrived. It may have come in with migrating fish from the Atlantic Coast, or may have hitch-hiked in ballast water from ships. VHS was first known as a disease of farmed rainbow trout in Europe as early as the 1930’s. However, it was not until 1963 that scientists confirmed the disease was caused by a virus. In 1988-89, the virus was detected in wild herring and cod from the U.S. Pacific Coast, and also in salmon and steelhead that returned to Washington hatcheries to spawn. Since then, the virus has been confirmed in several species on the Atlantic Coast and in Japan. The clinical signs of VHS include hemorrhaging in the muscle tissue and internal organs, pale organs, and bulging eyes. 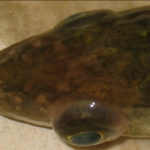 The clinical signs of VHS may include hemorrhaging (bleeding), unusual behavior, anemia, bulging eyes, bloated abdomens, and the rapid onset of death; however, these symptoms could apply to many different fish diseases. VHS must be confirmed by lab tests. Additionally, some infected fish may not show any signs and transporting these fish to new locations could spread the disease to new waters. What can you do to prevent the spread of the VHS virus? Attend the Northwest Lakes Conference at Telemark in June for all the latest updates and conversations with the experts. Since these letters were written, the Town of Bass Lake in Washburn County has enacted an ordinance that requires all lake landings to be closed in the event that VHS is discovered within 50 miles. Whose problem is it? It will be the boaters who enjoy our northern lakes who will determine whether or not our lakes will endure this and other threats from invasive species.